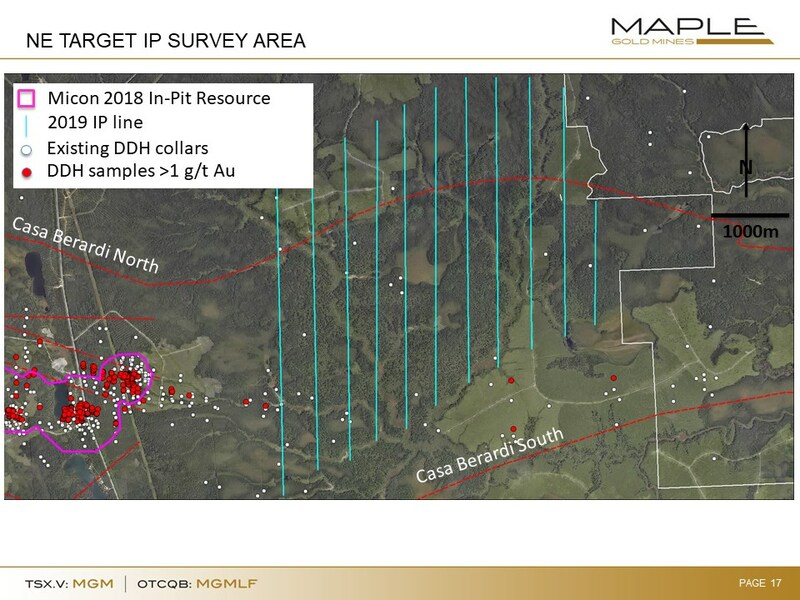 Montreal, Quebec--(Newsfile Corp. - April 10, 2019) - : Maple Gold Mines Ltd. (TSXV: MGM) (OTCQB: MGMLF) (Frankfurt: M3G) ("Maple Gold" or the "Company") has recently completed an Induced Polarization ("IP") survey with Abitibi Geophysique using their OreVision technology, along strike to the east and northeast of the 6 km long resource area. The survey included 400m-spaced lines covering a total of approximately 40 line-km, over a very sparsely drilled 15 km2 area (see Fig. 1). Data inversions and interpretations are pending. IP technology has progressed significantly since the 1990s when most of the previous IP surveys were completed on the Douay property; modern IP technologies allow much greater depth penetration than historical surveys were capable of historically. The currently producing Vezza gold mine is located approximately 20km to the east of the IP grid shown in Fig. 1., and the Company is hopeful that today's improved IP technology will detect one or more sulphide systems that could also lead the Company's technical team toward new Vezza-type gold discoveries. Previous drilling east of the current resource area (Micon 2018) has in general been limited, very broadly spaced and shallow. However, there are encouraging observations from the past drill data, including similar geochemical signatures to the resource area and several intercepts >1 g/t Au that that were discovered up to 6km east of the current resource area. Maple Gold's President and CEO, Matthew Hornor, commented: "The completion of this IP survey reflects the Company's continued commitment to property-scale target generation. We control a very prospective tract of ground straddling the Casa Berardi fault zone and believe that new ideas and technologies have the potential to lead to new discoveries and technical breakthroughs for us at Douay. We plan to methodically develop and prioritize new prospective targets and selectively drill test our highest priority targets as they are defined." Fig. 1: OreVision IP survey lines covering potential eastern extension of the resource area, as well as additional targets to the NE along and near the Casa Berardi North fault. DDh samples >1 g/t Au projected vertically from hole trace. The scientific and technical data contained in this press release was reviewed and prepared under the supervision of Fred Speidel, M. Sc, P. Geo., Vice-President Exploration, of Maple Gold. Mr. Speidel is a Qualified Person under National Instrument 43-101 Standards of Disclosure for Mineral Projects. Mr. Speidel has verified the data related to the exploration information disclosed in this news release through his direct participation in the work. Click the following link to review the Company's QA-QC standards and protocols: http://maplegoldmines.com/index.php/en/projects/qa-qc-qp-statement. Maple Gold is an advanced gold exploration and development company focused on defining a district-scale gold project in one of the world's premier mining jurisdictions. The Company's ~392 km² Douay Gold Project is located along the Casa Berardi Deformation Zone (55 km of strike) within the prolific Abitibi Greenstone Belt in northern Quebec, Canada. The Project benefits from excellent infrastructure and has an established gold resource3 that remains open in multiple directions. For more information please visit www.maplegoldmines.com. This news release contains "forward-looking information" and "forward-looking statements" (collectively referred to as "forward-looking statements") within the meaning of applicable Canadian securities legislation in Canada, including statements about the prospective mineral potential of the Porphyry Zone, the potential for significant mineralisation from other drilling in the referenced drill program and the completion of the drill program. Forward-looking statements are based on assumptions, uncertainties and management's best estimate of future events. Actual events or results could differ materially from the Company's expectations and projections. Investors are cautioned that forward-looking statements involve risks and uncertainties. Accordingly, readers should not place undue reliance on forward-looking statements. Forward-looking statements include, but are not limited to, statements regarding timing and completion of the private placement. When used herein, words such as "anticipate", "will", "intend" and similar expressions are intended to identify forward-looking statements. Forward-looking statements are based on certain estimates, expectations, analysis and opinions that management believed reasonable at the time they were made or in certain cases, on third party expert opinions. Such forward-looking statements involve known and unknown risks, and uncertainties and other factors that may cause our actual events, results, performance or achievements to be materially different from any future events, results, performance, or achievements expressed or implied by such forward-looking statements. For a more detailed discussion of such risks and other factors that could cause actual results to differ materially from those expressed or implied by such forward-looking statements, refer to Maple Gold Mines Ltd.'s filings with Canadian securities regulators available on www.sedar.com or the Company's website at www.maplegoldmines.com. The Company does not intend, and expressly disclaims any intention or obligation to, update or revise any forward-looking statements whether as a result of new information, future events or otherwise, except as required by law.